I haven't written anything in a while and there's a good reason for that. I'm not the kind of person that wants to talk about sad things and have people feel sorry for me. I don't like to announce when I'm having a crappy day or when I'm sick. I don't want that kind of attention. So I won't feel bad in the slightest if you skip this post. My grandpa is dying. It's been difficult. He has cancer that is inoperable. On top of that he has pneumonia and an infection that has spread through his entire body. It will be sad for me to see him go but it's even worse for me to know he is suffering. He is in a large amount of pain and can barely move. It's times like these that make me think about how cruel our own bodies can be. 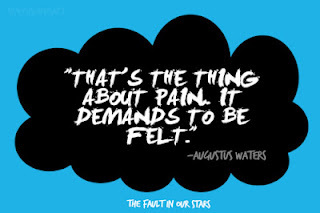 It also makes me think of a quote from the book The Fault in Our Stars. No matter how much we want it to go away or want to ignore it, pain demands to be felt. There is no escape from the pain he's in and it crushes me in a way I can't explain. To see a man I grew up with and saw as someone so strong (almost immortal) struggling to breathe and put on a respirator doesn't seem real. The pain is inside me and I don't want to feel it, but I don't have a choice.